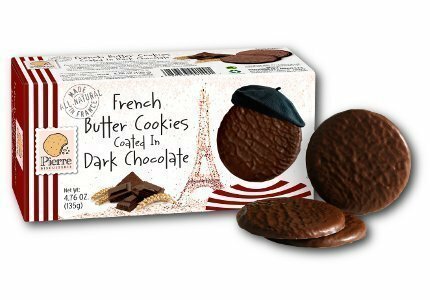 Pierre Biscuiterie French Butter Dark Chocolate Cookies, 4.76 oz (Pack of 2) by Pierre Biscuiterie at Smokey Robinson Foods. Hurry! Limited time offer. Offer valid only while supplies last. Our butter cookies coated in Dark 55% Chocolate are thin and delicate. Once baked, the butter cookies are wrapped in a velvety chocolate and cooled. Our butter cookies coated in Dark 55% Chocolate are thin and delicate. Once baked, the butter cookies are wrapped in a velvety chocolate and cooled. Simply Delightful! Manufacturer: Biscuiterie De L'Abbaye S.A.S. Publisher: Biscuiterie De L'Abbaye S.A.S. Studio: Biscuiterie De L'Abbaye S.A.S. If you have any questions about this product by Pierre Biscuiterie, contact us by completing and submitting the form below. If you are looking for a specif part number, please include it with your message.